Gleaners is our women's group. 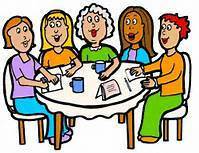 We meet every third Tuesday September through June in the Community House which is next door to the church building. Throughout the year we have social events like our annual Christmas party and our June celebration. We also have informative, learning evenings where we have had speakers on a variety of subjects such as aging, yoga and exercise, and even international travelers who have talked about the places they visited or lived in like Viet Nam and Estonia. We also organize and sponsor an annual Holiday Fair every November. We make crafts together and individually to sell at this event. If you are interested in learning more, stop by our meeting on a third Tuesday (7:00 p.m.)September to June!